Controls flies, mosquitoes, gnats, mites, chiggers, fleas and ticks. 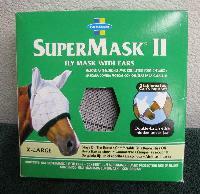 Contains aloe, lanolin and other emollients to moisturize skin and produce a healthy-looking, shiny show coat. 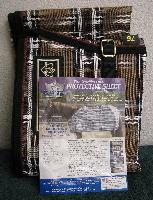 Contains a sunscreen, two insecticides and two repellents. For use on horses. Active ingredients: permethrin 0.2%, pyrethrin 0.2%, and piperonyl butoxide technical 0.5%. Effective long-lasting fly control that won't sweat off. Provides repellency, quick knock-down, and long-lasting protection from flies, gnats, lice and mosquitoes. Cypermethrin. 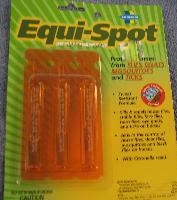 Equi-Spot kills and repels house flies, stable flies, face flies, horn flies, eye gnats, and ticks, and helps control horse flies, deer flies, mosquitoes and black flies. Packaged with three 10-mL tubes per blister pack. Citronella scented, sweat-resistant formula. Contains permethrin, 45.0% and oil of citronella, 33.2%. 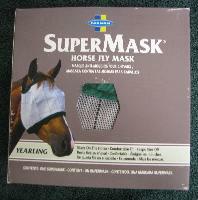 Repels and kills house flies, stable flies, face flies and horn flies, and discourages infection. Provides long-lasting protection for fast healing. For use on horses, ponies and dogs. Contains pyrethrins 0.2%, piperonyl butoxide technical 0.5%, and di-n-propyl isocinchomeronate 1%. Okay for use on superficial wounds. 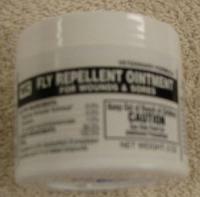 Fly Repellant Roll On 2 oz. Repels and kills house flies, stable flies, face flies and horn flies, and discourages infection. Provides long-lasting protection for fast healing. For use on horses, ponies and dogs. Contains pyrethrins 0.4%, piperonyl butoxide technical 1%, and di-n-propyl isocinchomeronate 1%, N-octyl bicycloheptene dicarboximide 0.4%. Okay for use on superficial wounds. The revolutionary Kensington Protective Sheet offers ultimate protection against biting insects, dust and dirt, sun bleaching UV rays and trailering or paddock abrasions.